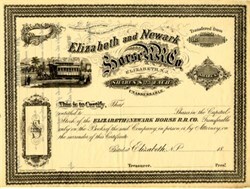 Beautifully RARE engraved unissued certificate from the Elizabeth and Newark Horse Railroad Company printed in 1864. This historic document was printed by Cutler, Tower and Co. N.Y. and has an ornate border around it with a vignette of a Horse Railroad Car with people passing. This item is over 142 years old. This is the first time we have seen this certificate for sale and beleive it is RARE.